Punta Cana is known around the world for its fantastic climate. It lies within some of the driest landscapes in the Caribbean. The weather is quite consistent year-round. Travellers visiting Punta Cana at any time experience mostly sunny and blue skies. The average day high temperature is around 30 °C (86 °F). 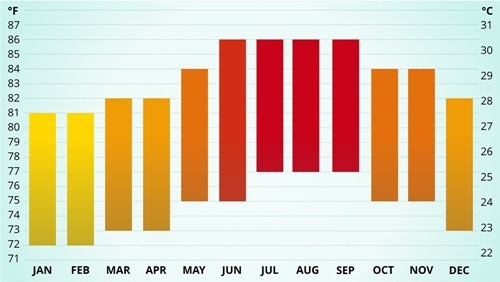 The hot and humid season runs from May to October. During this time temperature rarely falls below 25 °C (77 °F). However, due to the high humidity during this season, temperatures feel way hotter than what the thermometer shows. Fortunately showers or small tropical storms bring some respite from the heat during this season. The maximum average precipitation occurs in October.